A honeycomb of caves await in Pinamungajan for the spelunkers at heart. A glorious place for caving enthusiasts, the town is home to more than a hundred caves and once hosted the National Mounting Climbing Congress spearheaded by the Philippine Speleological Society. The most popular among these is the Kamangon Cave, which, with an experienced local guide, even the inexperienced can explore. The Kamangon Cave is located in barangay Lamac and is near the beautiful Udlom Falls. The cave is full of history, having sheltered Cebuanos from the Japanese soldiers during the second world war. Once inside, the space is huge enough for people to stand. One chamber leads to other chambers with equally magnificent and well preserved stalagmites and stalactites. One has to climb up and down boulders to get to the other chambers, approximately around 80 meters away from the mouth of the cave. After a grueling exploration, visitors can trek to Udlom and Sinungkulan Falls which are both a walk away from Kamangon Cave to have a refreshing treat. 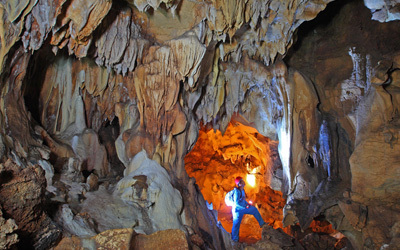 The rest in Pinamungajan’s list of popular caves to visit are Pangi, Limod, Udlom, Kabyaw, Sinungkulan, Nagkawa & Naglapus. To get to the Kamangon Cave, get a motorcycle for hire from the town proper. Fare is P60 for two passengers. Drop off point is at the Lamac Barangay Hall to get a permit to enter the cave. Fee for a guide is P150 per group of five. One has to trek through a river, climbing over huge rocks, to get to the cave. © 2018 Municipality of Pinamungajan, Cebu. All rights reserved.